Few days ago I posted about this great idea. Since it's so easy, inexpensive, and with immediate result, I couldn't wait to make my own. ...and I have my basket of name tags! I made mine writing the name in white, using a whiteout pen... dries almost immediately and I had my basket ready in my kitchen in about 20 minutes. (I'm excluding the time needed to get to the river, pick the rocks, bike back in a hot, steamy, 95 F, morning, and rinse the rocks - and take a shower, too -...). Those are fun! I want to do some on white rocks with a black sharpie. Hmmmmm. Another thing on my to do list. now, this was a busy day!!! 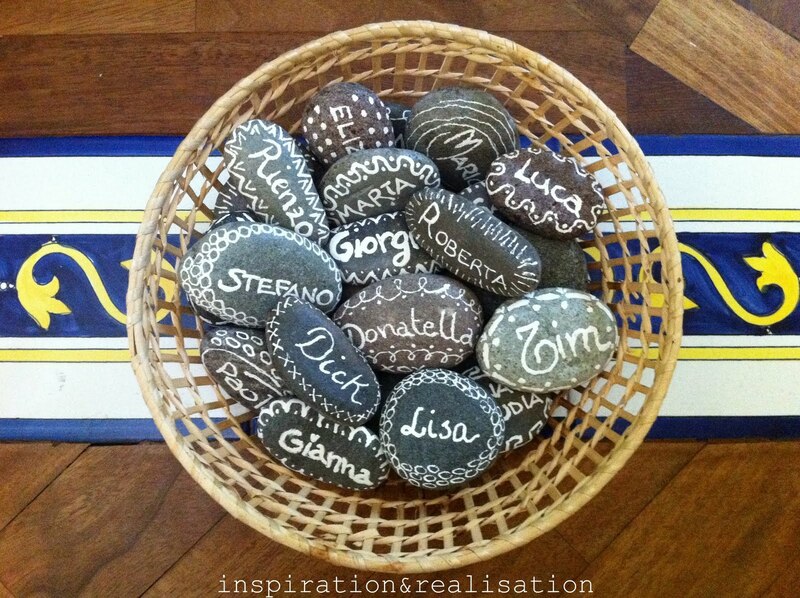 These rocks are just the cutest: a lovely name tag...should make some too!!! What a cute idea! I might have to have a little party sometime soon, just so I can do this! Very Cute! I will have to save this idea for the next time I have a party!! Oh my that is so cute and clever!! Where I live we have TONS of these on the shore will catch some now!!! I love this idea! Plus, any excuse to go pebble-hunting is fine by me. :) I would love to see you link this post up at Freestyle Friday over at Happy Hour Projects! Cute idea!MMM-I know I have a box of rocks somewhere! very cool! I painted pebbles like this fromBrighton beach for the name tags on the tables at my wedding. I have been inspired to try painting pebble critters with my preschooler! darling! great and easy ideas. love that. I'm a new follower and excited to look at future posts. I found you from tip junkie tuesday. What a fun idea! I like the names in the white. Thanks for linking up with DIY under $5! what a great idea! so original, and such an organic craft! I just did this to make garden markers! This is an awesome idea! :) My in-laws used to write the date and place on rocks where they went on vacations. Thanks a lot for sharing this with all people you actually recognise what you are speaking about! cool idea and beautiful blog! !i'm visiting it for first time! !and it's really so creative and i like very much all your posts about diy!! !great job!! Google tried to deliver your message, but it was rejected by the recipient domain."